For the past few days the East coast has been getting all kinds of warnings about 2015’s snowpocalypse. Since part of my job now entails shoveling all the snow, I knew we wouldn’t have time to cook dinner tonight. So while I had the time, I prepped dinner for tonight yesterday on Sunday Funday which usually entails me drinking beer or wine, depending on my mood & cooking. I’m on a huge Milky Chance kick so he was definitely helping me cook all afternoon. My roommate is always complaining that we never make Mexican food, and he is correct, we really don’t. Mexican food isn’t my favorite, but I do love margaritas. So to please him, since he is letting me work for him AND live with him, i’d make him some enchiladas for Mexican Monday. I found this recipe a couple weeks ago that caught me eye. We’ve been cooking a lot with chorizo and sweet potatoes so we happened to have just about everything on hand when I was looking up the ingredients for this recipe. I tweaked it a bit to get the flavors I wanted & it worked real well. I don’t know how “Mexican” this is, but it works. My enchilada rolling technique is not the best.. actually it’s horrible. If you make this, hopefully they turn out more enchilada shaped. Mine look like mini-burritos. They say it’s all about the presentation, but hey, if it tastes good, who cares what it looks like! 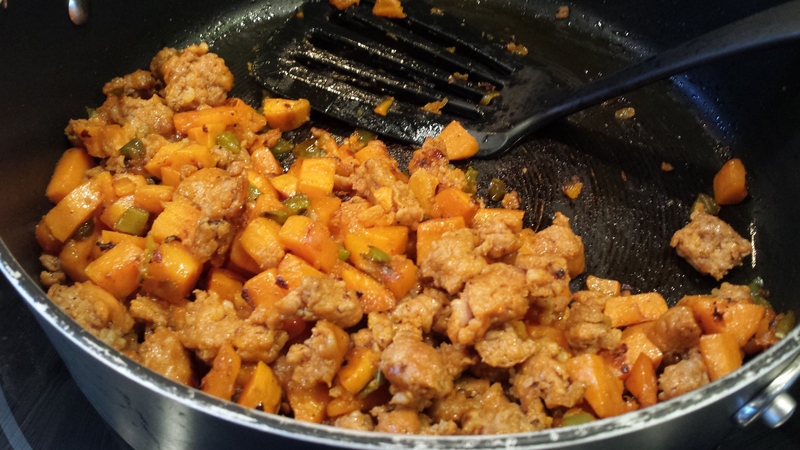 Cooked sweet potatoes, green peppers, onions, garlic & chorizo. Peel the sweet potatoes and dice into small cubes. Dice the onion. Remove the stem & seeds from the green pepper and dice into small pieces. Mince the garlic. In a large skillet, cook the sweet potatoes, green pepper, onion & garlic in olive oil, over medium heat until they become tender, approximately 10 minutes. Remove the casing from the chorizo and cook with the vegetables. Break up the meat and cook until browned approximately 5-10 minutes. While the vegetables & chorizo are cooking, spray a large casserole dish with non-stick cooking spray. Start prepping the tortillas by placing a dollop of refried beans in the middle of each tortilla. Spread the beans out in about a 2-3 inch circle. Once the veggies and chorizo are cooked begin filling the tortillas, evenly distributing the mixture amongst the tortillas. Since I am not a good enchilada roller, mine were more fat and burrito looking than enchilada looking. I had just the right amount of filling to fill 8 tortillas. Fill the inside and roll each tortilla folding in the ends to keep them enclosed. Place them in rows inside the sprayed casserole dish. 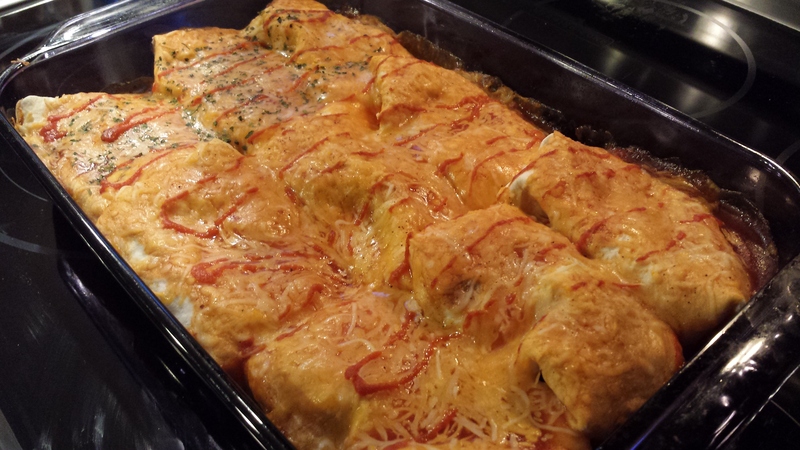 The enchiladas should fit the dish snuggly to help prevent them from unraveling. 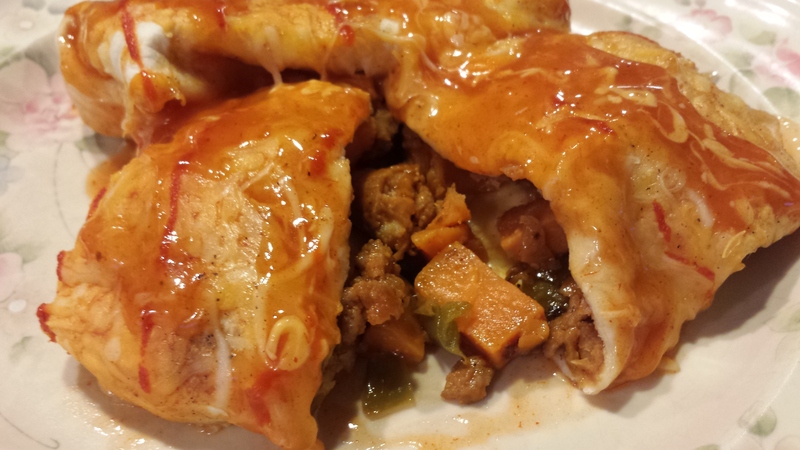 Pour the enchilada sauce over the rolled tortillas trying to evenly distribute the sauce as best as you can. Top with shredded Mexican cheese. If you like your food extra cheesy, add more cheese to the top. Sprinkle with salt/pepper to taste. You can also sprinkle some fresh or dried cilantro to the tops of the enchiladas if you enjoy that spice. I personally do not, but know some people do so I limited the cilantro to only a few of the enchiladas to please everyone’s taste buds. If you like your foods a little spicier I added some Siracha sauce over the top of the cheese. Definitely recommended – it gave it just the perfect amount of kick, but not too much. Simply do maybe 2-3 lines of Siracha per enchilada. If it’s too spicy you can serve it with some sour cream to help with the heat. Bake in the oven until the edges begin to bubble, approximately 20 minutes. Serve immediately & ENJOY.